The summer holiday season has come and gone. From the first week in December until the first week in January we ran 10 trains with a total passenger loading of 1368. An average of 136 passengers per trip. A good revenue earning season although a bit down on the possible maximum loading of 150 passengers per trip. Unfortunately for the steam enthusiast, the season was marred by the dry veld conditions which resulted in the majority of trains having to be hauled by diesel locomotives. Sufficient rain enough to dampen the dry ground arrived early January and only then was permission given to use the steam locomotive. By this time though, most of the tourist trade had already left for home. For the steam enthusiast this was a bitter pill to swallow but for the majority of tourists a restful day out on the train was all that mattered. Whether there was a diesel loco or a steam loco in front did not make much difference to Mr. Average riding on the train. The end of year holiday season is the busiest time of the year for the volunteers who man the train and as a way of saying thank you, the Apple Express Co. invited them to a light lunch on the Humewood Road station. It was a nice warm summer’s day and everyone enjoyed themselves tucking into the delicious cold lunch between the running of the morning and afternoon trains to Chelsea. 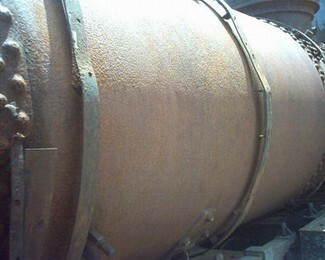 What do we do with all the old scrap and rusting locomotives parked at the Humewood steam depot. OK so they are a useful source of spare parts but the rusting hulks do look rather ugly all lined up on the skyline. It seems that some creative soul also noted the unsightly skyline and decided to do something about it. So armed with a can of spray paint he/she decided to beautify the hulks or as in this case, – graffiti them. 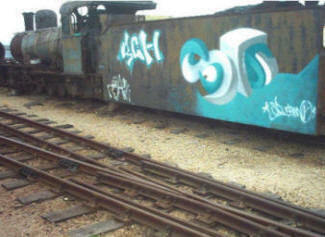 Unfortunately he/she did not finish the job, with only two of the string of locos being daubed with the aerosol can. Maybe we should organise a competition with a prize of a free trip to the person who does the best paint job on the locomotives. The current restoration work on the Kalahari No. 119 has exposed an interesting part of her history. During 1982 when this loco was still doing service for Spoornet, it was involved in an unfortunate accident. 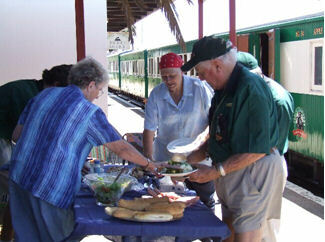 As far as can be established the train was on its way to Port Elizabeth with a consist of fully loaded apple wagons. Near the Heights Bank it left the rails and overturned. Apparently the train was running late and in an effort to make up time the driver increased the speed of the fully loaded train to beyond its ability to remain on the curving track. The ensuing accident caused the unfortunate deaths of the driver, fireman and the guard who also happened to be on the footplate at the time. The damaged locomotive was later repaired by Spoornet and put back into service until steam eventually gave way to diesel power and it was withdrawn from service. Now 38 years later No. 119 has revealed her secret. After the cladding was removed, the securing metal bands on the boiler were found to be flattened on one side and Sydney our fitter can only put this down to the bands not being straightened (curved) when the loco was repaired. Current rumour has it that because of its unfortunate history the locomotive’s cab number could be changed when it is brought back into service. Railwaymen like sailors are a superstitious lot and because a death had occurred on the footplate, the loco crew who will eventually be driving the loco have requested that the original cab number plate be replaced with a number plate from an already scrapped loco. I doubt whether the official asset number will change but just remember that 119 might not be the number that you see on the cab side when she eventually steams past your lineside point. As an experiment the Apple Express Company decided to try a short round trip to Chelsea Junction and back. The idea being to give a lot of families who could not afford the cost of the Thornhill trip, a chance to ride the train. On the first trip the response was overwhelming and the first run on the 14th January was a sellout. Because the trip takes about 2 hours to complete, the train is able to do two runs in a day. On the first run the train carried 150 passengers and on the second run 159 passengers. Because of this success, we arranged for a second Chelsea run on the 11 February. Unfortunately the response on this day was not as good. The morning run had about a 80% passenger capacity but the afternoon run had very few passengers. Subsequent Chelsea trip have had a mixed response from the general public but it seems that the morning run is more popular than the afternoon run. It has been decided to do one Chelsea run and one Thornhill run a month. The Chelsea trip will be at the beginning of each month.